Equities start the day lower because…well….pick your poison. Small Cap Underperformance. Crude Oil plummeting. Demonstrations in Hong Kong. Ebola in Dallas. ECB behind the curve. High Yield puking. Failed Technicals. iPhones that bend. Treasuries that won’t stop going up. Chinese internet giant IPOs. Seasonal weakness. #Growth Slowing. Seriously, pick one, because any / all of them are in play. After closing at a new all time high on Sep 19 it’s been nothing but straight down and there isn’t a single thing you can point to that makes sense more than the rest. So if someone asks you “why the heck is the market going down?” pick a few of those and go with it. Then move on to talking about pumpkins because you know what? Markets go down. And up. And down. Warren Buffett was on TV this morning reminding all of us that he doesn’t care what happens with the Fed or the ECB or with High Yield Credit Spreads. “I bought SEE’s Candies in 1972. It doesn’t matter where unemployment goes if I’m going to own it for 50 years”. That quote is refreshing right? On a long enough time horizon you shouldn’t care one bit about anything I wrote in those first few sentences. Except maybe the iPhone thing, no one wants a phone that bends. But guess what? I have the iPhone 6+ and it doesn’t bend. There are times in life you need to ignore random headlines and ridiculous conjecture because it’s completely unproductive. My gut tells me this is one of those times in the market. There’s a lot of noise out there, be cautious of what you blame for a 3% selloff. After the open, equities decided to do this to us, especially people across the pond. Whoa nelly, a sea of red with prices dropping faster than a Kmart yard sale. Europe ended the day down 2-3% as Draghi failed to deliver a punchbowl full of QE. Yep, that’s where we are now people, markets that get disappointed when Central Bankers don’t buy stuff. Investing in 2014…feel the excitement! So fear must be everywhere right? 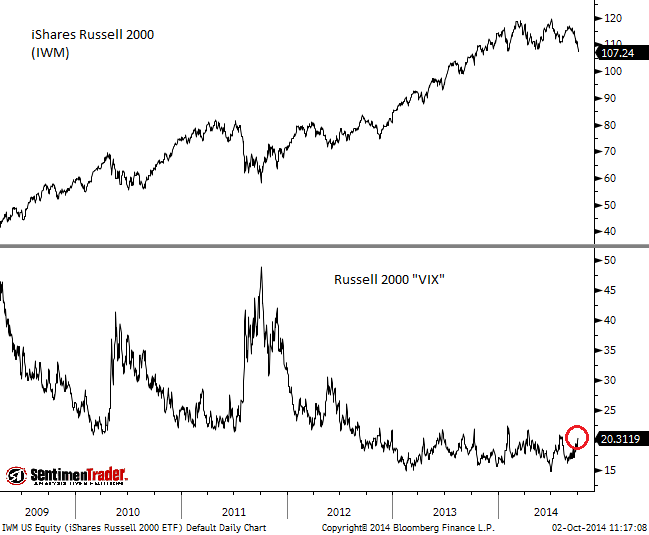 The Russell 2000 has been dropping like a stone lately, take a look at this chart showing the “VIX of small caps” (h/t @sentimentrader). 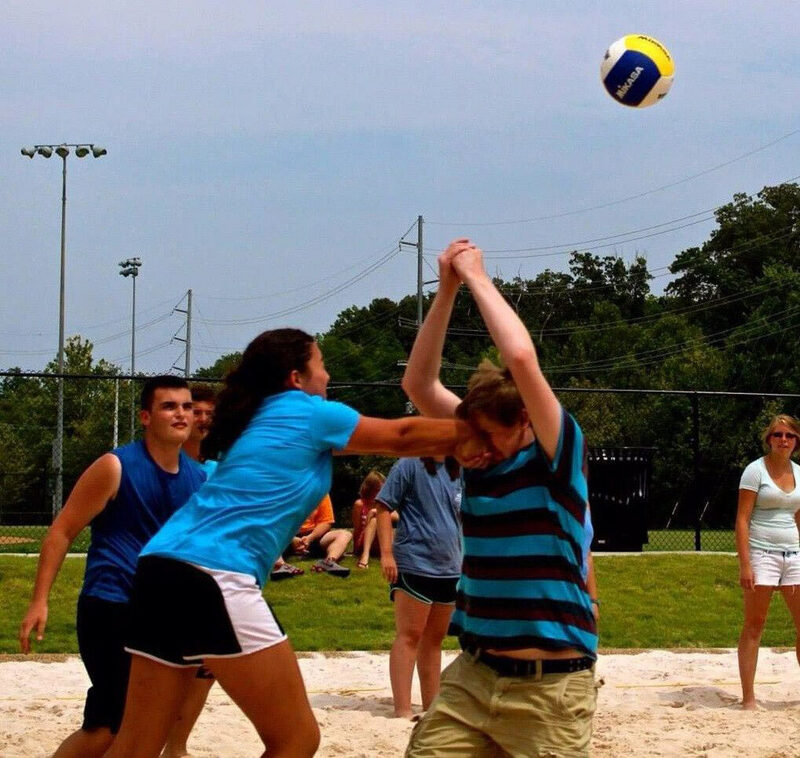 I mean the sheer, palpable fear displayed on that thing..…wait…man that completely blows up the narrative doesn’t it. Stocks rise and fall people, perspective is everything. What if I told you this “pullback” from the highs wasn’t even the steepest one in 2014. Well it’s not, not even close. After Europe went home we started putting the pieces back together and by lunch we sat on 1,943, down just 14bps. Which was WELL off the lows. What was the big winner today? AN, which rose 6%. Why did it rise 6%? Because Buffett said he wants to buy car dealerships. So there you go, efficient markets. Put that in your CAPM and smoke it. You think there are people who spy on Buffet and report back his daily patterns? Hey, Warren bought a Gatorade at the Qwik E Mart today load up on PEP. The afternoon was quiet but we did touch green numbers briefly. Unfortunately it wasn’t enough and we closed flat on the day. Hey, do you wanna see what happens to sentiment in a ridiculously overblown media hyped selloff? Look no further! Riddle me this Batman: Would everyone go full Bear if we are in an “over hyped and over believed stock market bubble?” Of course not. Is that how it was in 2007? I don’t think so my friend. I remember buying bank stocks because “these things aren’t going much lower they always go up”. Now people puke everything when one guy gets sick in Dallas and the VIX rises a few %? Come on. If this was a stock market bubble sentiment would be unchanged because no one would care a lick. Oh well, keep your eyes on credit markets because they will tell us when the selloff is over. High Yield in particular. 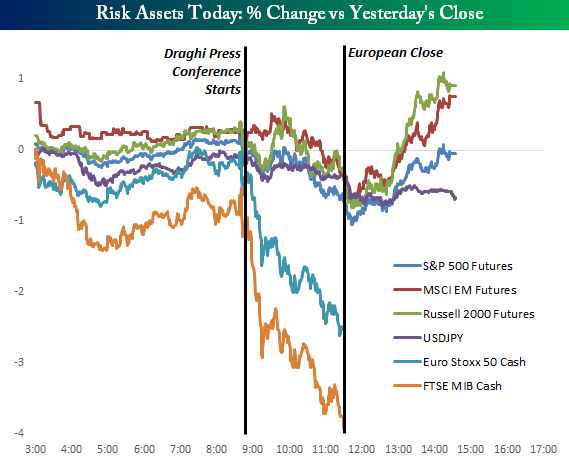 Succinct Summation of the Day’s Events: Draghi failed to deliver more cowbell, Europe got crushed. Back in the US we hit oversold status and bounced. No conclusions to be drawn yet. I’m in…. I want one. Does this make you mad? I seethe after watching it. I plan on reading this every day. I really do. I want to do far less of it. Ever wonder what people make in Hollywood? Well now you know. We’ll end tonight with a 12k calorie eating challenge. That’s right…this guy eats 12k calories in 45 mins. Sounds like Lambeau field tonight! !